Col's Creating Memories: October Whiff of Joy Blog Hop! Welcome to the October Whiff of Joy Blog Hop! If you didn’t come here from lovely Karina's blog, then head on over to the start of the hop at Katharina’s blog.. I don’t want you to miss a single stop on this hop! 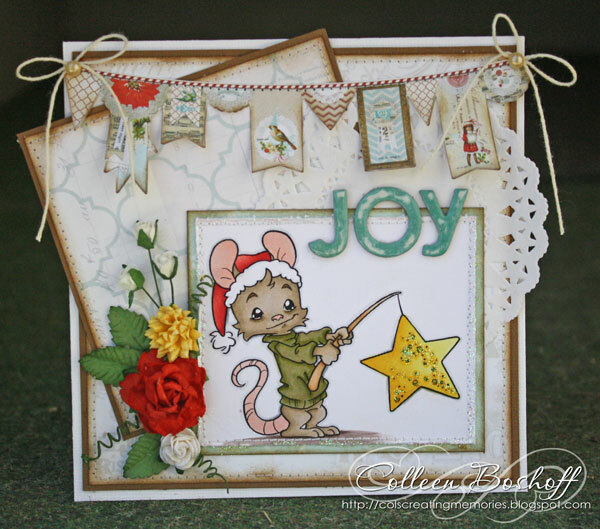 Our newest release captures the sweetness and nostalgia of Christmas! Each charming image will make you smile and they are absolutely perfect for your Christmas tags, cards and decorations. Henry and Maya are joined by our cheeky penguin brothers this month. In addition, our popular Fall Kit will be released as individual digital images this month. The hop will remain open until midnight CEST (Central European Summer Time) Wednesday October 10th CEST. Winners will be announced by Katharina on her blog. I love this image of Henry - Christmas Star. The papers are MME 'All Is Bright' and I have fussy cut the banner from the papers. The doily and alphas are from my stash and I finished it off with some Wild Orchid Craft flowers, some stitching and a little bit of stickles for some christmas sparkle! Your next stop is lovely Angie's blog. Thank you for joining us and I hope you have enjoyed Whiff of Joy's blog hop and the awesome creations from my fellow team mates! Gorgeous! I love the banner too! Gorgoues card with great colouring and lovely details! What a great card - Just love Henry and his little star. Such a sweet card. I just love the banner!!!! 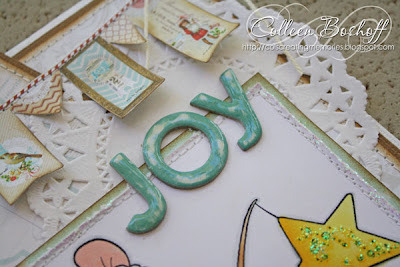 Oh Colleen, how lovely is that cute banner and the letters JOY... And your coloration is gorgeous! Love to see so many different interpretations of the same image. WOJ DT is simply the best ;) isn't it?! Lovely Hugs! So sweet love the whole vintage look of the card and the stamp is very fitting for that look. Your colors are lovely...thanks for sharing! I love your card sooo much, sooo cute! Lovely lovely card and I love this Henry stamp! Love your card and the cute image!! A great colorfull card. Like it a lot. The image is very sweet. Oh the card is sweet and your colouring is fantastic. Thank you for the chance to win this wonderful stamps! Ach,das Motiv mit Henry und dem Stern ist einfach zu süß! Das du den Stern bunt beglittert hast, gefällt mir sehr gut!!! Auch die Idee mit der süßen Wimpelkette!!! Your Card looks so lovely :) Little Henry is so cute!! Hey,Col this image i love most,it´s sooooooo cutey and you´ve made a wonderful card.So diffrent and special small extras,absolut great.The colouring is very pretty and the sparkle not so much - just I like.All in all it´s a rounded work,it couldn´t be better!Thank you for sharing your lovely work. Very cute card love how you made the banner. Your details are wonderful. Great job on your card. A very beautiful card. So nice. Eine wunderschöne Karte ist da entstanden.Danke für die tollen Ideen und die Chance zum Gewinn. A fantastic Christmas Card, looks fantastic with that great image, w great card creation! This card us just too adorable. I love how you added the little banner across the top. I just love him. Thank you for sharing it with us. Love how you used so many different elements on your work! Its gorgeous! Thank you for sharing!! I like the great colors for the image. And the card is beautiful! Lovely card. I like the stamp and the way you made a card with it. Thanks! Wonderful card, love the stamp! Love your bright card and that stamp is just adorable.